Skin is peeling all over the top of the scalp. Lots of vellus hair but nothing that I can say is new. Some terminal hair poking through but they look like existing hairs. » look like existing hairs. » I’ll keep you updated. Thanks Baccy, I appreciate it very much!! I hope you will get some nice results. Thanks again. » I’ve developed a painful toothache in one of my molars. Did you check for hair on your molar? Seriously though, when did you start to notice terminal hair after the first wounding? Thanks for sharing your progress. Please keep your health at the highest priority, and good luck. The results of your latest testing will be very interesting. At what point would you expect to have some initial idea of what the results will be? When I tried my last test, this seemed to occur after a couple of weeks, but now it’s been about a month and things still seem to be improving. Frankly, I’m having some trouble believing my eyes at what I’m seeing in the small-scale sanding test I did. Not to give the impression that it would give ideal results in one treatment, but there are definitely some results to this, and the question at this point seems to be “how effective can the process become, with the correct modifications?” One thing that seems amazing is that the hairs don’t start out as thin vellus hairs, they get thicker than that right from the start. Whether the hairs will develop to the same thickness as terminal hairs or even continue to grow as they are, I obviously can’t say at this point. Next time I’ll probably repeat a very similar test (using milk thistle as EGFr inhibitor) in a different area with pre-depilation. Won’t have the option of trying this until possibly next week, though. By the way, upon close inspection of the progress, I’ve gotten the impression that possibly the follicles are starting out very close to the surface and then migrating deeper over time… It’s really hard to be sure just by observing with the eyes but that seems to me to be what’s happening. Have you also had this impression? I can’t wait to see Baccy’s results in a month or two. I have a good feeling about this. baccy, are you eating tomoates, garlic etc…It’s a very natural, cheap & safe way to boost your lithium intake. I would strongly advise you to do so since your skin is peeling now and it seems like a good time to boost lithium intake. hair follicle DO start at the surface and then as they get larger, they get deeper - It’s sort of like standard operating procedure for folicles. » get deeper - It’s sort of like standard operating procedure for folicles. Another crucial thing we need to work on is restoring scalp health. I believe it would be hard for a follicle to push downwards into a scalp that has thinned out due to baldness. Hence, a follicle maybe created but will only produce minitaurized hair because it didn’t get a chance to bury itself into the skin & establish necessary blood supply. I’m really stumped by this issue…has anyone got any ideas? I was thinking about frequent (once a week) gentle abrasions and continous application of Folligen - not sure if it would work though. » itself into the skin & establish necessary blood supply. » application of Folligen - not sure if it would work though. » happening. Have you also had this impression? Results when they come certainly seem to be fast and what you say ties in with the diagrams I’ve seen of follicle formation. Baccy, have you started to think of what kind of haircut or hair style you’re going to get?? » you’re going to get?? But of all haircuts I would like a simple crop, certainly no longer than a half inch. It will suit me better. I also don’t want a really low hairline; I want to maintain a mature male hairline which means a certain amount of recession. I also wouldn’t like it to be too dense, I don’t mind scalp show-through if it’s uniform. Coffee, I accidentally shaved my head using the 0mm setting (I usually have it at about 3 mm), so I decided to do some simple abrasion tests while the hair was that short. The intention was not to grow hair, but just make see the effects of abrasion on the scalp. I still have lots of hair so my goal is to see what can be done in that type of situation, i.e. at what point will hair start falling out from the abrasion alone. I would naturally like to find out if the procedure can be successful without having to remove too much existing hair. As an initial experiment I used a rough body peeling scrub containing AHA (concentration unknown) and one of those special gloves made for dermabrasion. I scrubbed hard for a few minutes, and let the lotion sit for a few minutes more to let the AHA do its job. The scalp was slightly red. When I subsequently applied copper peptides (Folligen) it stung a bit, but not too much. The next day, you couldn’t notice anything: no redness, no soar scalp, no hair falling out. Basically, it was as if nothing had happened. My impression from that simple experiment is that much more aggressive dermabrasion can be done witout loosing hair and is probably needed to get any results from the Follica DYI procedure. Do you mind telling me the how much hair you have and if you have any other experience from dermabrasion of the scalp other than what you wrote a few days ago in that other post? I already know Baccy was completely bald. I’m basically trying to get a basic understanding of how much abuse the scalp can take without excessive shedding. » » you’re going to get?? » show-through if it’s uniform. Yeah, I don’t know why guys want to have an adolescent-like hairline. Sometimes I see pictures of guys who had a hair transplant because their hairline is not in the same place as it was when they were 15. Once I have my hair back, I don’t even want to think about hair anymore…so I’m gonna buzz mine pretty short. I’ve spent way too much of my life already worrying about hair - and I’m only 24.
btw, how’s the noggin looking today Baccy? Here’s another good image of what happens in the embryo. This is the process that Follica hopes to replicate. The dermis and epidermis form first. Hair follicles form second. The order is sequential, not concurrent. 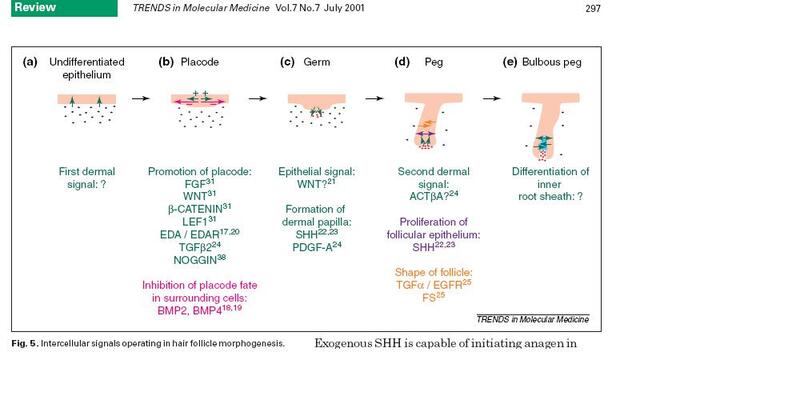 The initiation of a hair follicle depends on complex interactions between the epidermis and the dermis. I mention this because it gets back to the debate on when the ‘embryonic window’ opens. If you’ve just removed the epidermis (via sandpaper, chemical peels, dermabrasion procedures, etc.) how do you reckon hair follicles are going to be created? That is to say, if the creation of hair follicles depends on the epidermis, and you’ve just nuked the epidermis, you are obviously not going to be creating hair follicles at that point. So, there’s no point in mucking with the EGF pathway immediately after wounding, since follicles are not even eligible to be formed at that point. Ideally, you would wait until the epidermis has been regenerated to a near-complete state. When that happens (that is, re-epithelialization has taken place), then the epidermis is ready to cross-talk with the dermis to form hair follicles. It’s at this point that you want to intervene. Having said all this, we still don’t know what happens if you start early in humans. In mice, enhancing WNT early doesn’t seem to be a problem (other than the fact that follicles will lack pigment.) Is the same true of EGF? I wish I knew. Although it’s pointless to start early, one reason you might want to start a little early is to ensure that you don’t miss the window. » process that Follica hopes to replicate. » second. The order is sequential, not concurrent. » between the epidermis and the dermis. » you are obviously not going to be creating hair follicles at that point. » wounding, since follicles are not even eligible to be formed at that point. » form hair follicles. It’s at this point that you want to intervene. » want to start a little early is to ensure that you don’t miss the window. Promoting wnt (lithium orotate/caffeine/dmso/others…) 1 week before wounding. Continue to promote wnt (no breaks)and start to inhibit egf-r on day 1. Continue to promote wnt and inhibit egf-r for 2 weeks, doing each at separate intervals day/night. No shampooing or soaps on scalp after wounding, just wash with water pressure from the shower. Unless starting early on boosting wnt and inhibiting egf-r is counter-productive to the experiment, the only thing I can think of that left, if the above doesn’t work, is the use of topical cyclosporin with the experiment. » » process that Follica hopes to replicate. » » second. The order is sequential, not concurrent. » » between the epidermis and the dermis. » » form hair follicles. It’s at this point that you want to intervene. » pressure from the shower. Doesn’t the first patent mention wnt up-regulating but the second patent has no mention? And if so what would you suggest is the reason? Also it appears that many of the DIY people are having a problem taking oral egf-r for long periods. Shouldn’t this be minimized by taking only during the so called embryonic window? » » » process that Follica hopes to replicate. » » » second. The order is sequential, not concurrent. » » » between the epidermis and the dermis. I’m far from being an expert by any means, but I stand by my own belief that egf-r inhibitors are taken topically.